Imagine visiting Yellowstone National Park when…. Wouldn’t this scenario be the ideal time to visit the park? 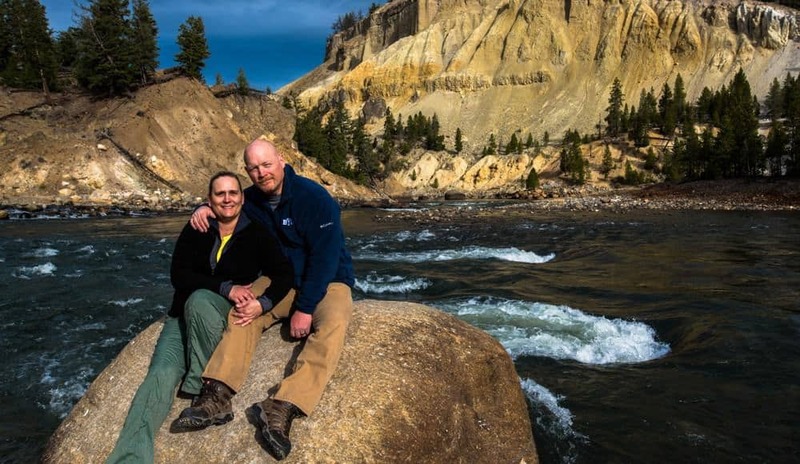 A Yellowstone vacation in the Fall is one of those ‘best kept secrets’ people rarely share. Dave and I spent a week in Yellowstone this past October. It was spectacular! If you want to visit the park and experience the bliss described above, keep reading! 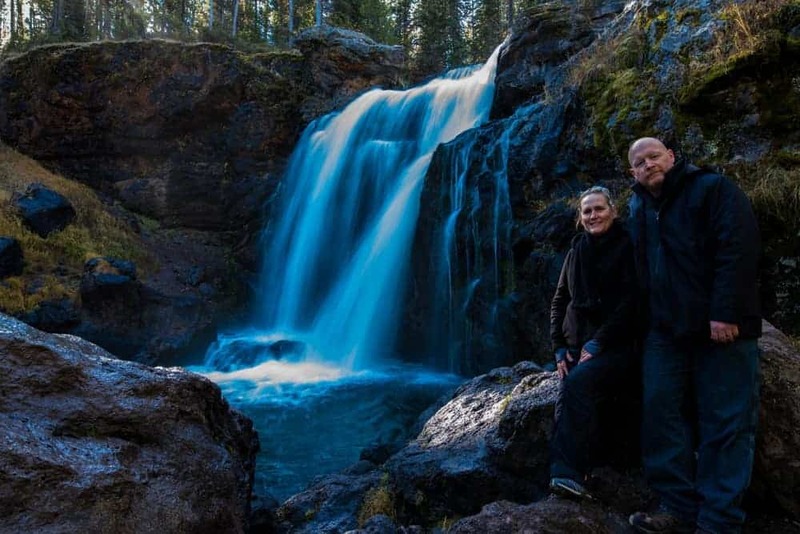 This article provides information, tips and personal experience on what to see and do on a Yellowstone vacation in the Fall. Check closure dates before planning your fall trip – Yellowstone Park Facility Opening & Closing Dates. During our trip the second week in October, we found limited services for food and gas available. All general stores were closed. Check the dates when the general stores in the park are open. TIP: Pack a cooler with drinks and food for your travels within the park. Buy these items at a grocery store outside the park. The stores inside the park, when open, are pricey. The service stations around the park open and close seasonally. The one we used often was at the 4-way stop in the Canyon area. This station had limited food and drinks to purchase. There are gas pumps open year-round at Mammoth Hot Springs and Tower Junction. The weather in Yellowstone during the autumn months can vary greatly between weeks and even days. Days get gradually shorter as winter nears, and temperatures drop rapidly once the sun goes down. The week before our trip in October, Yellowstone had a snow storm that closed roads or required chains to travel those roads. By the time we arrived, the roads were open and clear, but the mountain peaks were covered with snow. There were sections of Dunraven Pass that would be wet during the day from the melting snow on the sides of the road that turned to ice at night. You had to be careful traveling those sections in the early morning or at night. There was also construction on the road from Norris to Mammoth, with delays up to 30 minutes. TIP: Know the Current Conditions at Yellowstone before you arrive so you can plan and modify your itinerary as needed. The weather during the Fall months in Yellowstone can be unpredictable. One day it could be sunny and warm, and the next it is cold and snowy. Be prepared for sudden changes. Always be equipped with clothing suitable to various types of temperatures and weather. Dress in layers and plan to add and remove the layers often. Hiking in Yellowstone, even if you only go a mile or so from the trailhead, is the best way to experience the park without the distraction of too many other people. We took the short trail down from Tower Falls to the Yellowstone River and found complete solitude for almost an hour as we photographed the area. During the fall, your hike can yield amazing autumn colors and opportunities to see wildlife as they get ready for the coming winter. You could see bear, elk, pronghorn, bighorn sheep, deer, moose and eagles. TIP: Carry Bear Spray and know how to use it! Be educated about bear safety: the National Park Service and YellowstonePark.com websites provide information and videos on this important subject. During the summer months you can rent bear spray in the park. The bear spray sold in the park is expensive compared to buying it before you go. 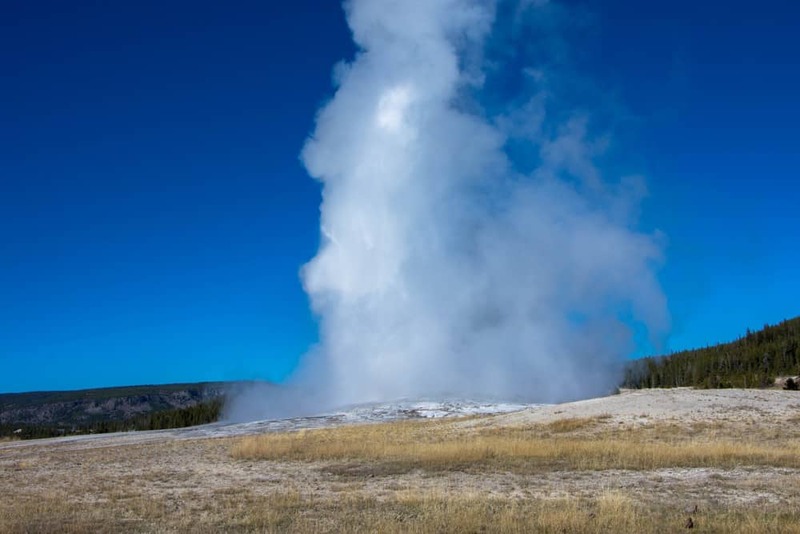 Cold weather also means more steam around the geysers and geothermal features. Our Old Faithful photos are a bit disappointing because the steam hides the water shooting upward. The steam in the air at Grand Prismatic prevented our photographing the ring of color at the edge of the pool. We instead focused on the colorful edges instead which produced spectacular photos in spite of what we had imagined we would photograph at this location. But Yellowstone in the Fall provides AMAZING opportunities to capture a wide variety of wildlife! Do not approach bears or wolves on foot within 100 yards (91 m) or other wildlife within 25 yards (23 m). Keep a safe distance from all wildlife. Each year, park visitors are injured by wildlife when approaching too closely. Use roadside pullouts when viewing wildlife. Use binoculars or telephoto lenses for safe viewing and to avoid disturbing them. 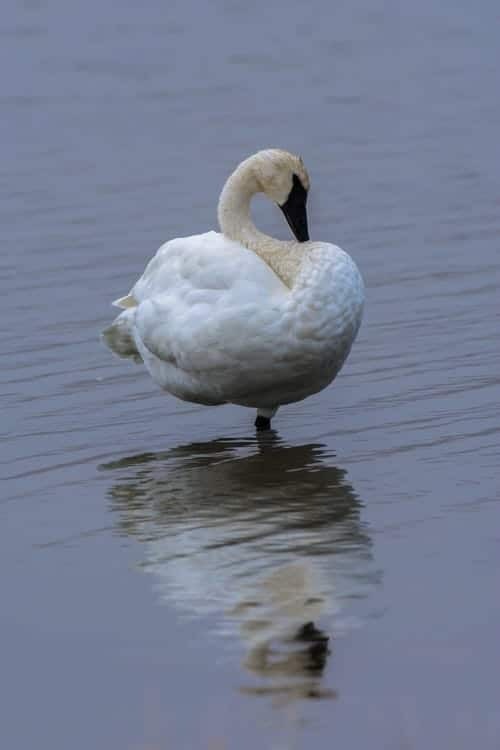 By being sensitive to its needs, you will see more of an animal’s natural behavior and activity. If you cause an animal to move, you are too close! It is illegal to willfully remain near or approach wildlife, including birds, within ANY distance that disturbs or displaces the animal. 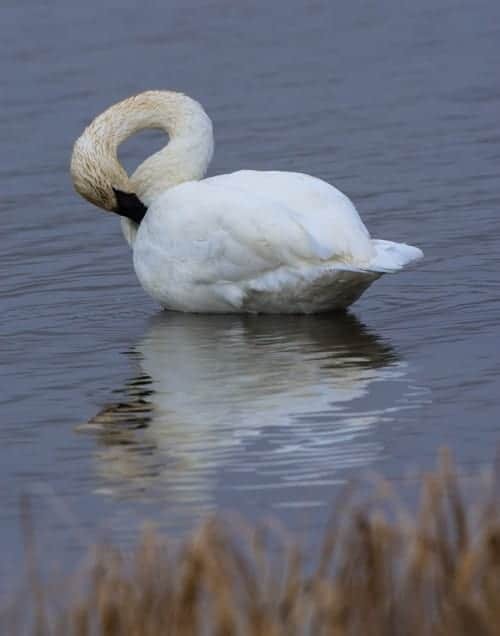 Educate yourself about Safely Viewing Wildlife and watch Wildlife Safety Videos produced by the National Park Service. 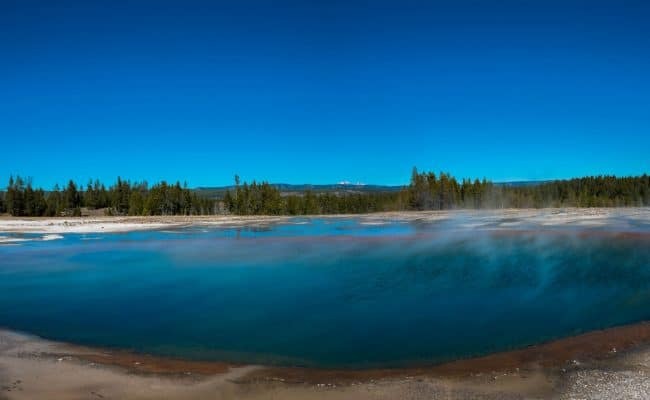 It’s important to understand the best way to visit Yellowstone National Park without making headlines! Elk enter their breeding season during the fall, called the rut. During this time, male elk are vying for the attention of females, and they do this by bugling. It’s hard to describe this sound. 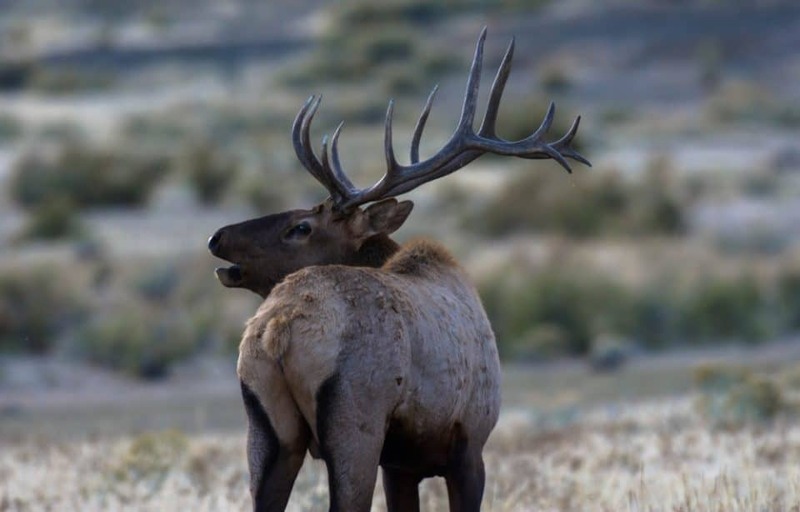 Hear the bugle of an Elk thanks to YellowstonePark.com. Learn more about Yellowstone Elk on the National Park Service website. 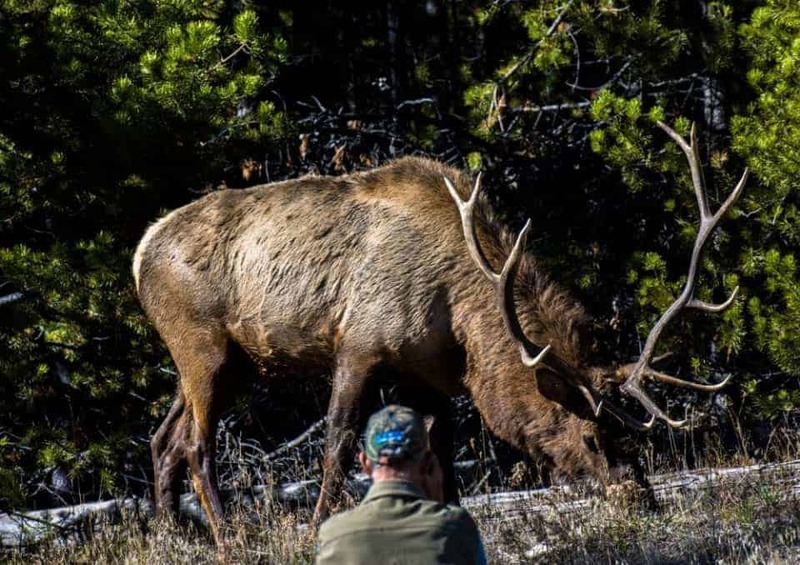 The best place to view elk in the Fall is in the town of Mammoth. We were amazed at the number of elk there. DO NOT be like this guy. He is way too close to this bull elk. “Bulls Behaving Badly: Yellowstone in a Rut” accurately describes the elk rut in Mammoth and provides insight on viewing them safely AND keeping your car free of dents from large elk racks! We found elk along the Madison River, along the road from Tower to Mammoth, all around the city of Mammoth, and at the north entrance just outside the city of Gardiner, Montana where we stayed each night. During the Fall, bears are preparing for winter hibernation. You may see them foraging for berries, nuts and other snacks to keep in their dens. Black bears are usually active during daylight. Look for black bears in small openings within or near forested areas. 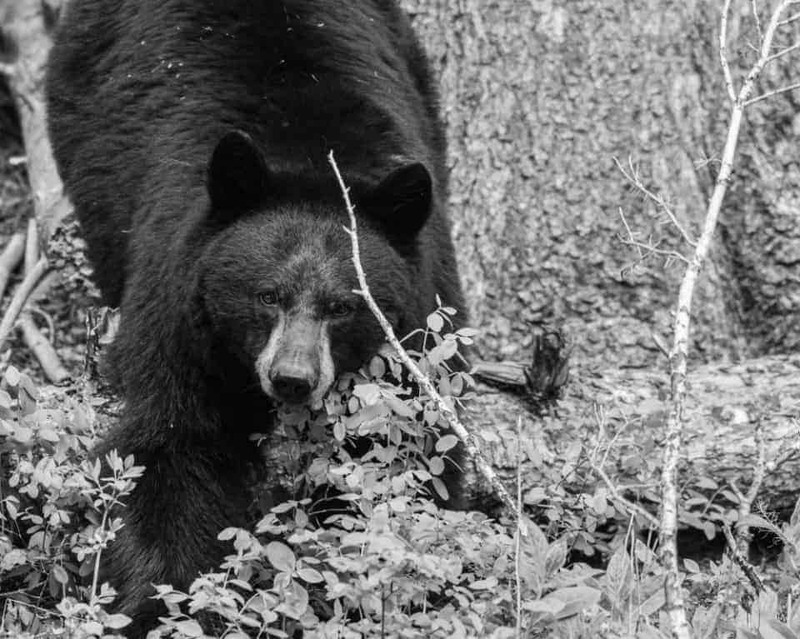 Black bears are most commonly observed on the northern portion of the park along the road corridor from Elk Creek to Tower Falls, and from Mammoth Hot Springs north to Indian Creek. Grizzly bears are active at dawn, dusk and night. Look for grizzly bears with a high power spotting scope in open meadows just after sunrise and just before sunset. 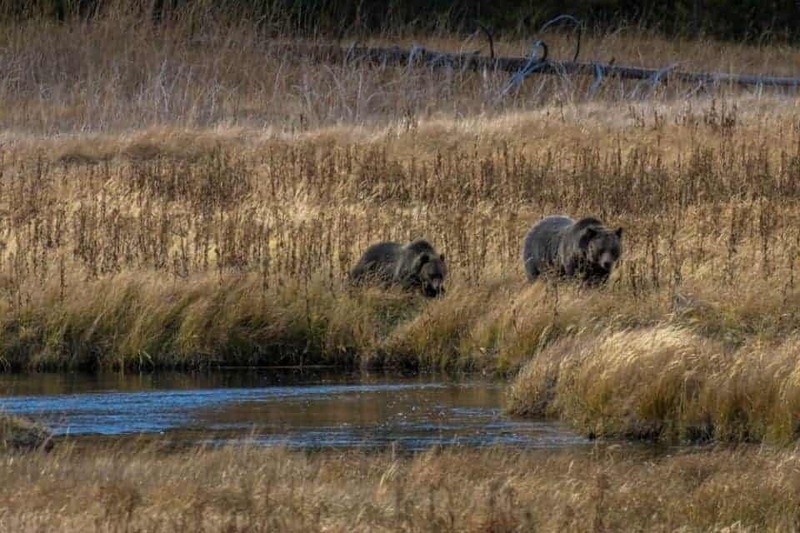 Grizzly bears are most commonly observed in Lamar Valley, Swan Lake Flats, Gardiners Hole, Dunraven Pass, Hayden Valley and in the wet meadows along the East Entrance Road from Fishing Bridge to the East Entrance of the park. We were lucky to have two separate grizzly bear encounters. One was early morning in Lamar Valley. A grizzly ran down the hillside toward the river with the intention to cross the river and the road. As soon as the bear saw the mass of people along the road watching, he quickly turned and ran back up the hill to the safety of the tree line. Driving through Gibbon Meadows, just west of Norris, we saw several cars pulled to the side of the road. When you see this, it usually means a bear sighting. Luckily we were able to park so we were off the road. In the meadow was a grizzly sow with her cub. Watching wildlife in nature, so close and in person, was enthralling. Watching the spectacle of humans on the roadway or in the meadow trying to get closer to the bears, was very sad to see. Watch this video about Bear Jams in Yellowstone to understand your responsibility as a visitor at the park viewing wildlife. READ: Is the US National Park Pass Worth It? Most bison head down to lower elevations during the fall because Yellowstone winters can be so severe. This annual migration helps them to better find the resources they need once the snow accumulates. 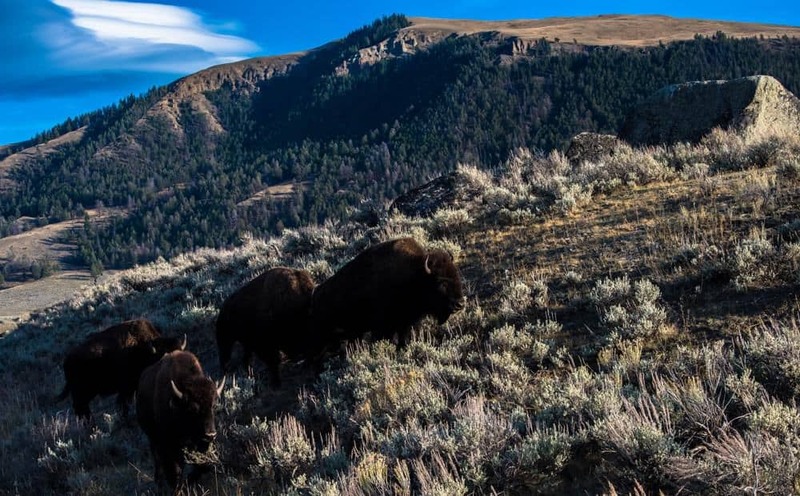 Hundreds of bison head to Lamar Valley, Mammoth Hot Springs, the Old Faithful area, and sometimes cross Yellowstone’s border into Montana farmland. This migration causes Bison Road Jams. Use patience and common sense when encountering these animals on the roadways in the park. Bison have injured more people in Yellowstone than any other animal. Bison can sprint three times faster than humans can run. Bison are unpredictable and dangerous. The safest view of wild animals is often from inside a hard-sided vehicle. 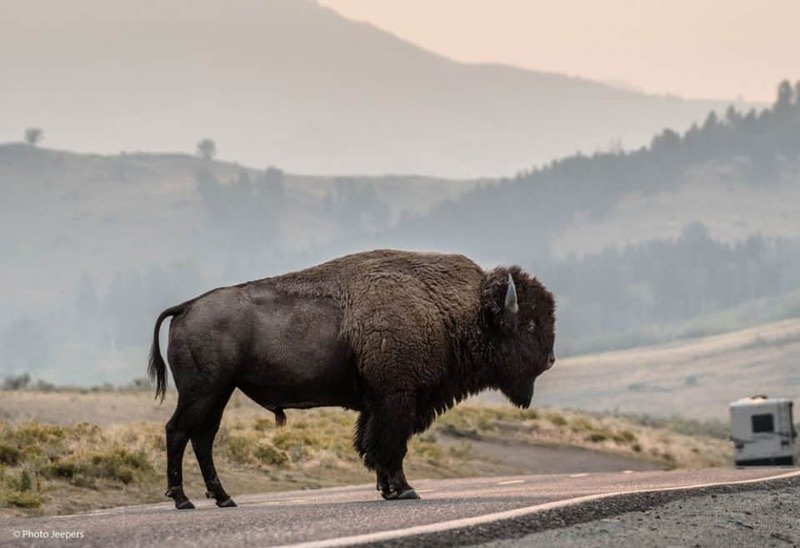 Our favorite bison images came from a cold, foggy morning near Old Faithful. 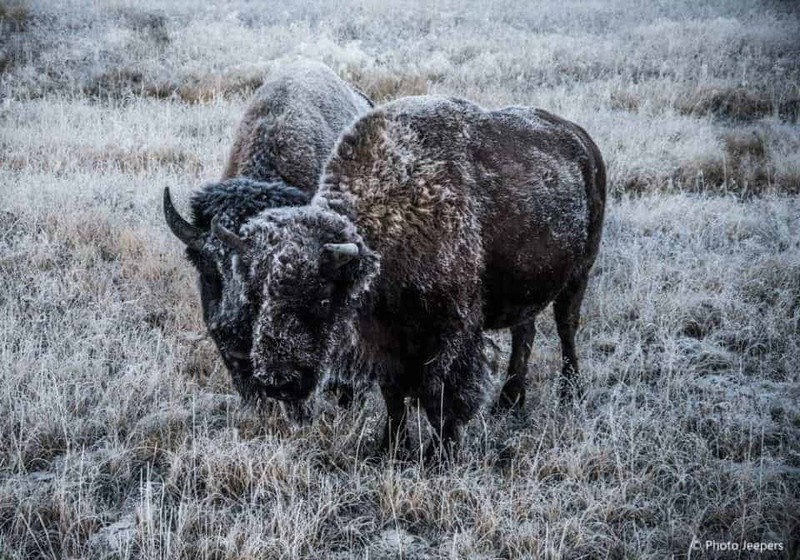 The bison in the meadow were coated with frost and the surrounding grasses in the field. We heard wolves howling in the distance. It was a quiet, cold and eerie scene. Yellowstone in the Fall is filled with the wonderful sights and sounds of wildlife. We were honored to watch the rituals of animals as they prepared for winter. The Yellowstone waterfalls in the autumn aren’t as filled with water as they would be in the spring, but they are still spectacular! 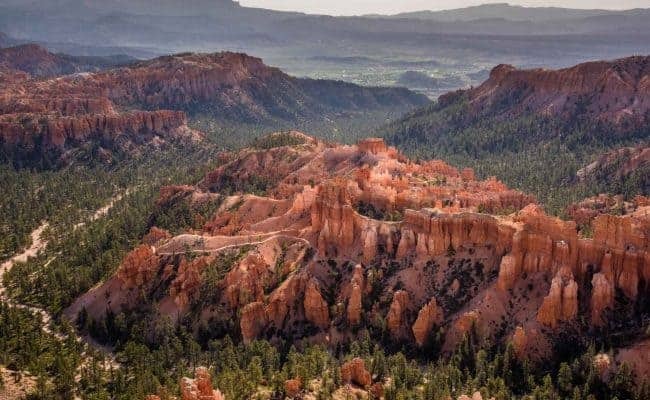 Remember to purchase the US National Park Pass – it’s a good deal! We recommend an Airbnb or hotel suite with a kitchen where you can shop at the grocery store, make dinner at home, and pack lunches to take on our hikes and adventures during the day. Here’s a $40 coupon for Airbnb or use Hotels.com. I absolutely loved reading this. You put in such detail and effort — excellent guide. I haven’t been to Yellowstone yet, but when I do I’ve pinned this so I can reference back! Thank you the feedback, our aim to help others plan the best trip they can! What a great and super informative article! I LOVE your photos of the elks, they look so noble. I’m very envious of all the wildlife sighting. I visited Yellowstone a loooong time ago (2005?) and I think I only saw some female elk. But it was in August. Guess I’ll have to try to get back for a fall trip! Finding wildlife is always tricky – we knew we’d see a lot of elk in the fall, but were so happy to see the bears! Thank you for your positive comments about the photos and article. Your photos are incredible! You’re definitely right about November, places like this are always quieter than. So nice to have some space. We always prefer off season any time we travel anywhere! Thank you for your comment about our photos. 🙂 If I ever go to the US for myself, it would be for places like this. Very Detailed Blog!! I loved the way you have explained everything. You are truly blessed to get all those beautiful captures. Great tips for each month. I didn’t know there existed a bear spray! Yes, bear spray is important in many of the US National Parks. We haven’t had to use it yet, but always carry it in Yellowstone! A very well written article with clear direction. I enjoy details hence loved it! Easy to follow and a great guide! I really want to visit Yellowstone National Park some day. I always wondered what the temperatures were like in Autumn and it sounds like they are quite unpredictable. Your photos are simply stunning! I prefer cooler weather when I’m outdoors. I only needed my coat when out photographing early morning and late evening. The rest of the day was warm enough to wear a long sleeve shirt or light jacket. BUT the weather is unpredictable and can change from hour to hour. Snow can happen in the fall at any time, but it’s not as cold as winter when that happens.